A couple of quick comparison pics of Ruby, who arrived here 8 weeks ago. 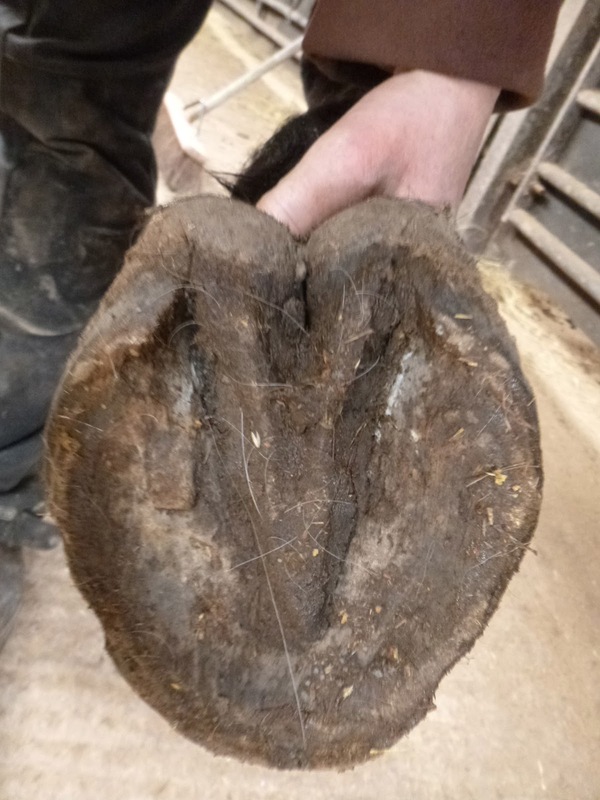 Although she had a reasonable palmar hoof her feet were flat and she'd had a recently bruised sole. She found stony ground a struggle and was clearly feeling her feet. Today she is much more comfortable and her feet are beginning to build some good concavity. You can faintly see a ridge which extends from the bars round the sole. I've always found this is an indication of thin, weak soles and that as concavity and internal sole depth improves the ridge disappears, as this one is doing now. A lot of trimmers like to take down bars and ridges like this but in my experience its usually a mistake which makes horses sore. If you think about it, a weak foot will gain a lot of stability from them - as well as protection for the sensitive internal structures of the foot. Once the whole foot is stronger then this extra support is no longer needed and wears away on its own. As is so often the case, when it comes to hooves, the horse knows best! First up, Krista and Buddy who enetered their first competition since Buddy went lame. 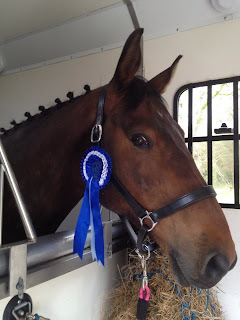 The full story is on Bud's own blog here: http://buddysbarefootadventure.blogspot.co.uk/2013/04/buddy-bounces-back.html and is well worth the read, but suffice it to say that Buddy came home with a blue rosette which would have been a red rosette if Krista hadn't forgotten a bit of the test! Wonderful news - is it me or does Buddy look a tiny bit smug...?! And for an added gold star, he was also happy to stomp across this en route to the competition - proof, if proof were needed, that he really has grown himself a better set of feet! "Made a last minute decision to compete again today. After our win the other week I decided to step it up and do a novice test. 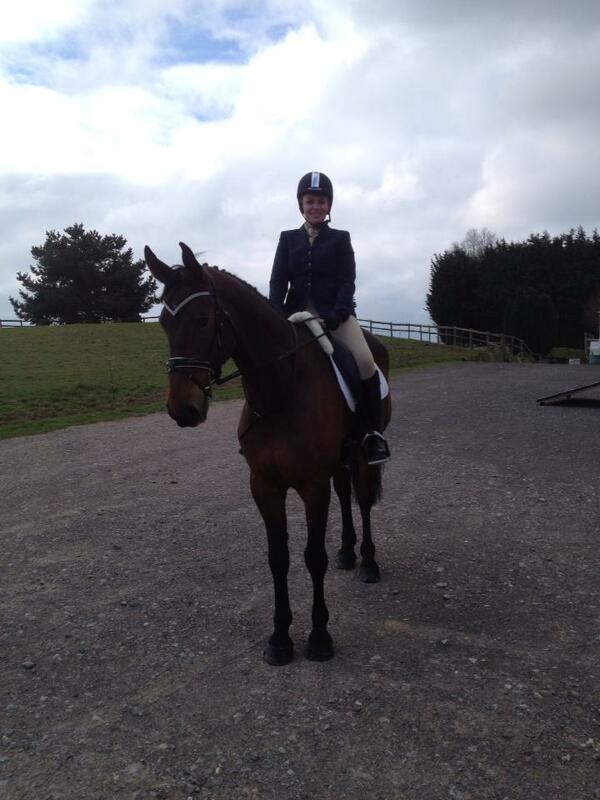 It was a bit windy and he was a little tense but he still managed to win with 68%!" No photos, but more big grins from me and I think Kate was being a bit modest when she said he managed to win on his own! 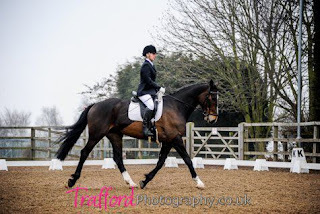 MASSIVE congratulations to both Krista and Kate and of course their 2 gorgeous boys :-) It is so thrilling with both these horses to know that their naturally wonderful movement has come back despite their previous lameness. This post has been prompted by something I have read online recently. Its confirmed what I already knew - that when it comes to hooves the only person who can be totally trusted to tell the truth is the horse. An owner can build their own version of the truth (via the internet or elsewhere) but the horse and the hooves will NEVER lie. 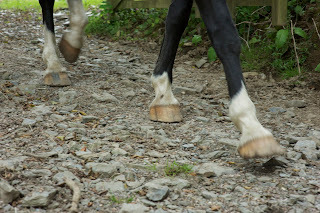 Healthy hooves are basically a product of only two things: appropriate nutrition and lots of miles when they are able to load and land in the most efficient way possible. If these are in place, then the world is your oyster and hooves will not only cope with but thrive on the toughest terrain and very high mileage. This sounds very simple but in the domestic environment its not always easy. Horses can have metabolic problems or illnesses which make healthy hooves difficult. 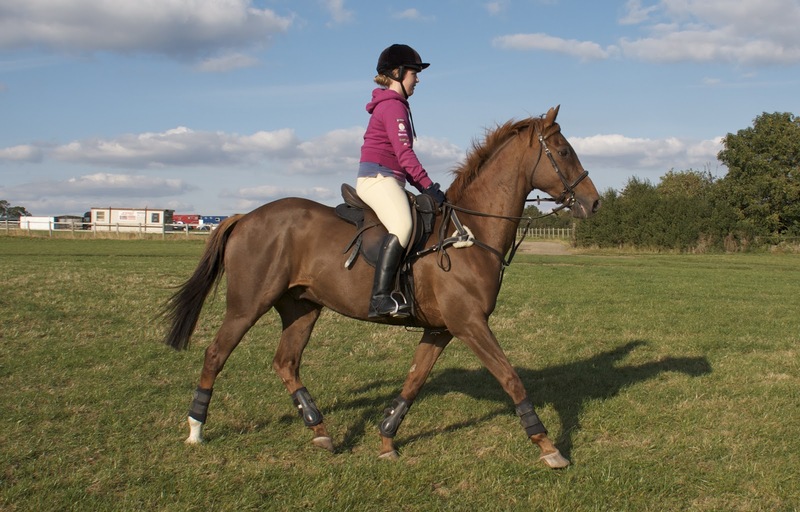 All of us as owners struggle to balance our management of horses because they can't roam for vast distances every day and because the grass we grow in the UK is very often more like junk food than the perfect nutrition for an equine athlete. 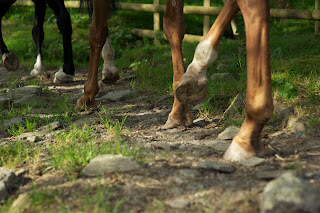 But its not impossible either - what I see time and time again in the owners who have horses here is incredible dedication to providing the best possible diet and environments for their horses and the best possible work-load - in order to keep their horses' feet in tip-top condition. They manage it at home, they manage it on livery yards, they manage it with limited turnout and they manage it with strict yard rules. Its not an easy option but its certainly do-able, for more owners than you would think. 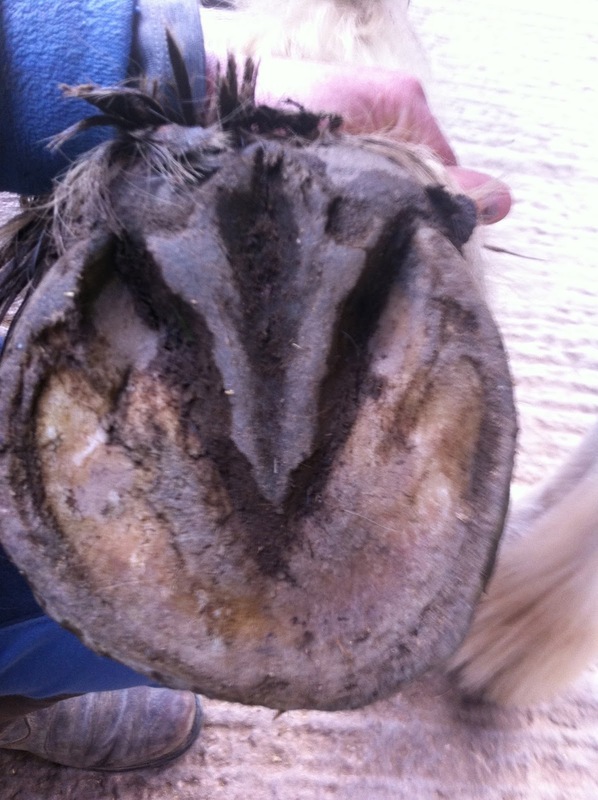 There are also 2 huge fallacies about hooves - first that you can somehow trim them to become healthier (nope - comes from the inside out) and secondly that you can ignore biomechanics and biology without compromising horse and hoof health (nope - shortcuts don't work here either). What doesn't result in perfect hooves is ignoring the rules. 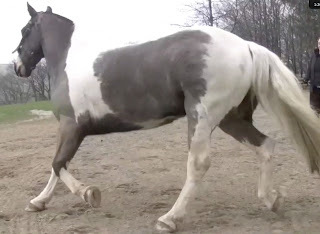 If you can't feed your horse properly (which always means you need to control starch and sugar, usually means you need to boost mineral levels and may mean you need to restrict spring grass), hooves will suffer. 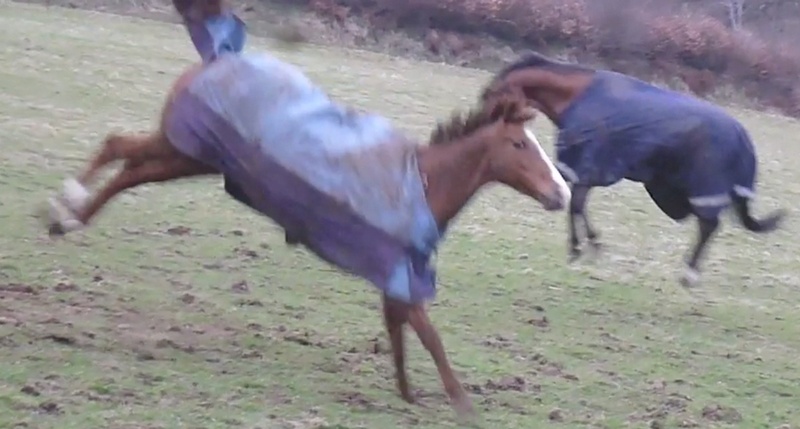 If you can't exercise your horse, hooves will suffer. If you try to trim a foot without first paying attention to how hooves load and land, hooves will suffer. But here's the ray of light - its not the end of the world if you ignore the rules. Many horses in the UK cope despite things being less then perfect (let's be honest, thats often the case in life!). They have less than perfect nutrition and their feet are weak and under-developed. 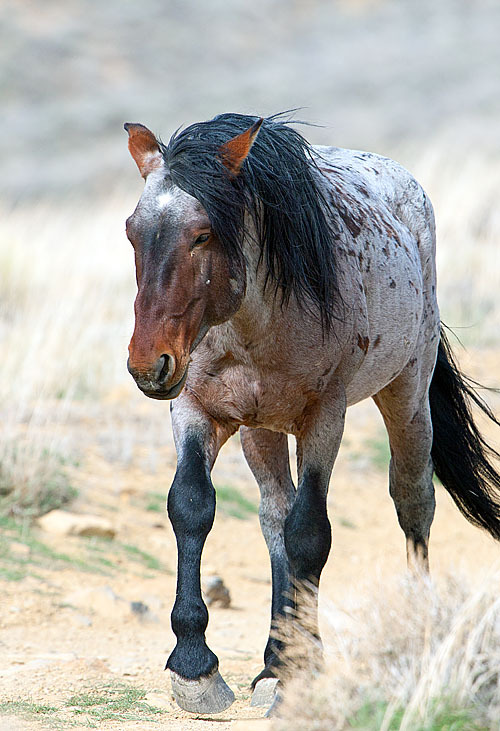 This means their hooves aren't strong enough to walk, trot and canter over the toughest terrain, but either owners use boots or shoes or decide to exercise over easier surfaces, avoiding stony tracks or hard ground. 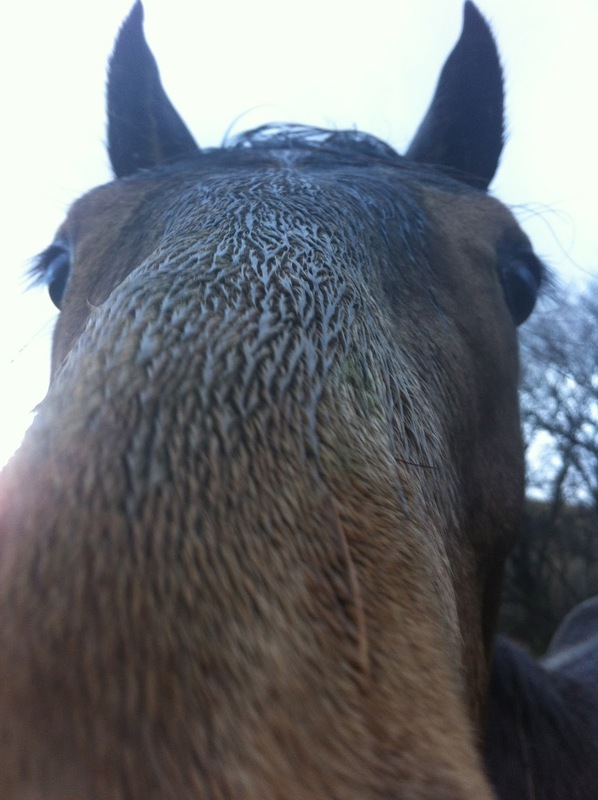 We live in the real world - things are less than perfect and horses and owners make compromises for reasons of practicality, economy and convenience. That's ok...you pays your money and takes your choice. It's perfectly possible to have horses with fabulously healthy hooves in a domestic environment - but its not easy and the more issues you have with your horse's health the more difficult it will be. 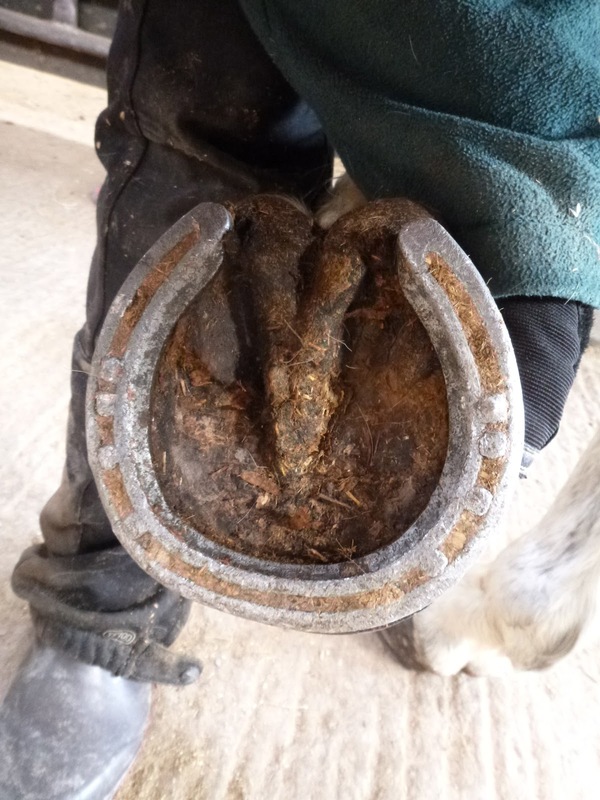 Its perfectly possible to work a horse hard with unhealthy hooves - but you won't do it barefoot - you'll need to boot or shoe it, and your horse's unhealthy hooves may well be the weak link which fails sooner rather than later. That's the other side of the coin, of course: the hoof will always tell the truth because you can't buck mother nature's rules! Charlie B has now been here for 4 weeks. 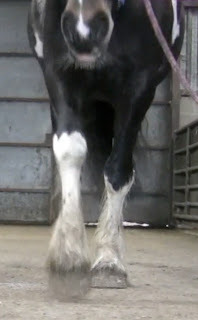 He arrived with a diagnosis of poor foot balance which had led to ringbone. 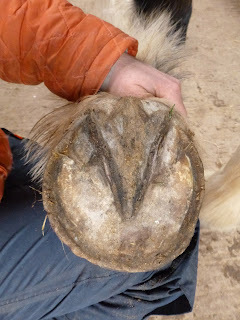 Like most of the horses who come here, he also had a weak and under-run palmar hoof as you can see from his initial photos. 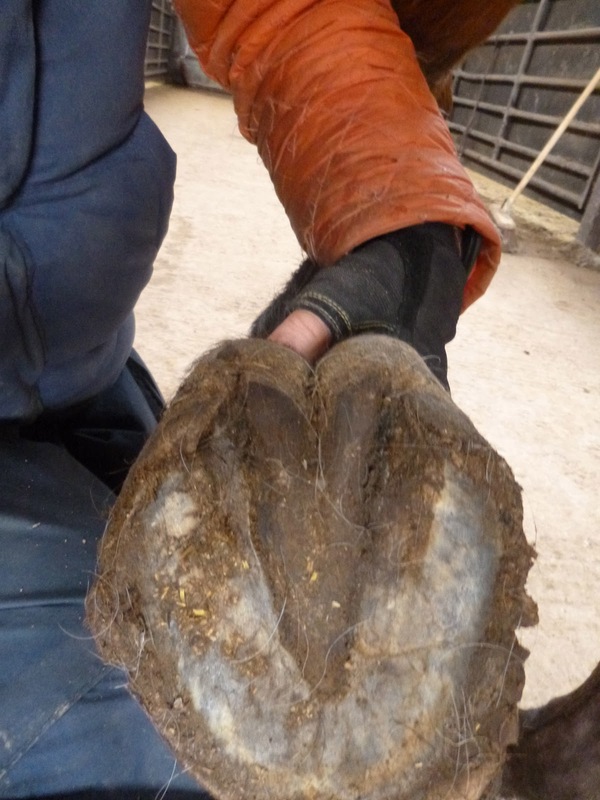 Four weeks further on he is starting to build a better palmar hoof and you can see the new angle of hoof growth. His toe is still snubbed at the bottom but I suspect the new growth will be straighter. Shoes hide a multitude of sins but even in the day 1 photo you can see that his frog is contracted and weak. Four weeks on and its beginning to strengthen but of coursehe has a lot of work to do before his feet are as good as they can be. Already some good changes in his digital cushion but the frog is still pretty weedy and needs to become a lot tougher! These feet belong to new horse Freddie, an extremely smart boy who has evented at a very competitive level. 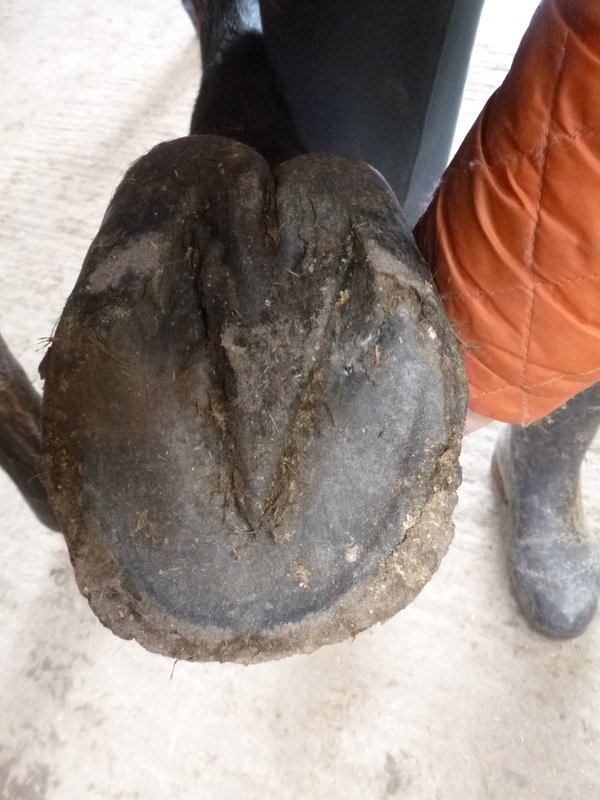 There is lots of good stuff going on with his feet - nice hoof wall, hairline not too distorted - but the aspect which jumps out at me is how collapsed the palmar hoof has become. He does have a digital cushion but its dropped and run forward, as you can see more clearly on the sole shot. 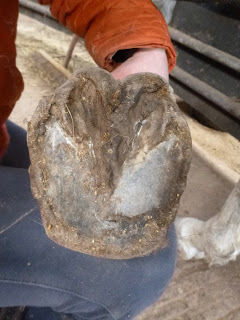 The frog is also weak and distorted but - as we know - changes in feet can happen very quickly and Freddie is already trying to grow a better hoof, as you can see from the new angle at the coronet. Fortunately, although his frog is weak its not developed a central sulcus split and it looks as if it could "un-crush" fairly rapidly given the chance. Hard to see on a two dimensional picture, but the digital cushion has become flattened and under-run though I am hopeful it will be a lot stronger in a few weeks. 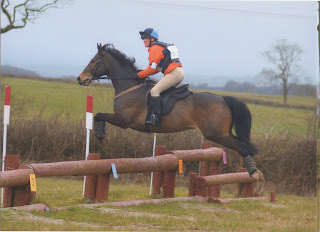 Andy awarded me a day off on Sunday :-) He not only did all the horses and let me have a lie-in but packed me, Felix and Winston off on a jolly - a day out at Winkleigh at the Torrington Farmers' hunter trial. Felix, bless him, was on tremendous form even though I felt a bit creaky. 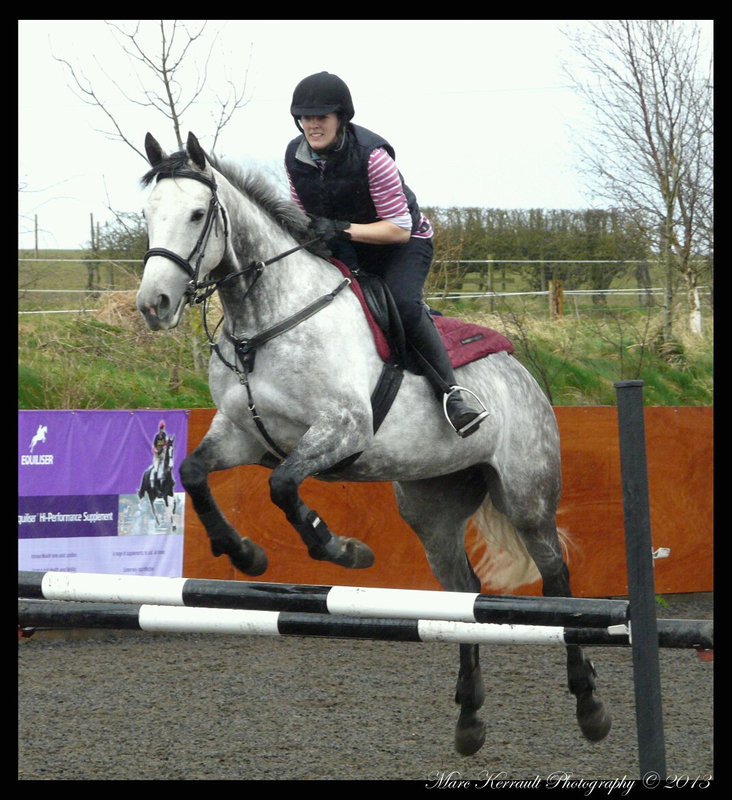 He hasn't jumped a stick since last year's rehab reunion but as always was like a guided missile, jumping everything including corners and skinnies as long as I was looking in the right direction...! 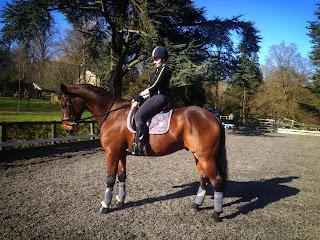 As a follow on from yesterday's blog, I thought I would share with you the alternative take on spring turnout. Though I love to see the horses galloping about like maniacs, I am on the whole happier when they are able to enjoy the fields without trashing them(!) - my farming head at war with my rehab head! Its also time for Paddy's update. He is an ex-racehorse who came out of shoes a few weeks before he arrived. 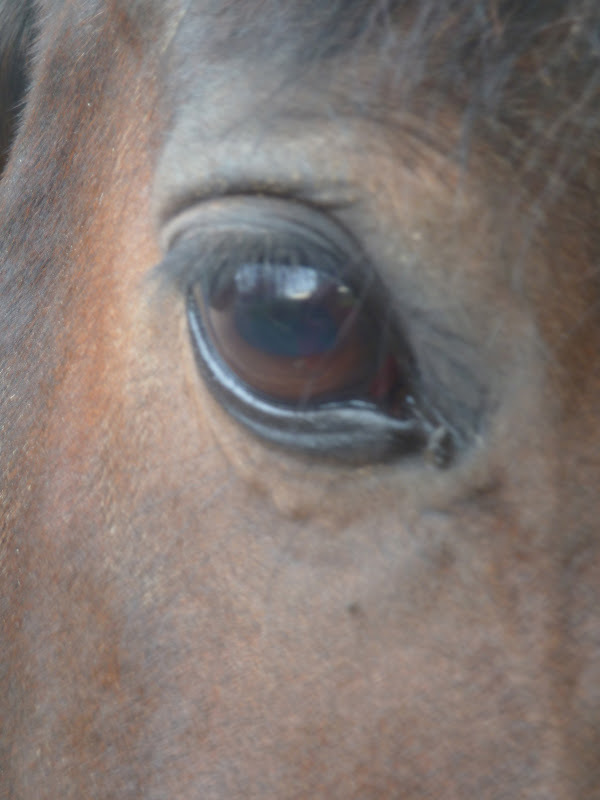 Rehab was his last chance - with a neurectomy as the alternative if rehab isn't successful - no pressure then! 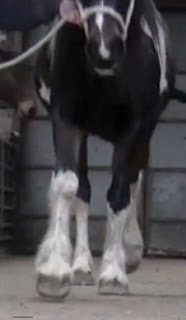 Over just under 4 weeks you can see that his frogs are beginning to beef up and his heels are already less contracted. He is still pretty uncomfortable on tough terrain so its case of letting him carry on moving within his capabilities on surfaces he is happy on. As you can see, he had already started to grow a new hoof capsule - there is a hint of it at his coronet. Today, a few weeks further on there is more growth and a more even hairline. His foot looks whacky at the back but we already know from the sole shots that its becoming stronger. Caudal shots confirm his digital cushion is developing - even an ex-racehorse can improve. A quick update on Ruby, as her owner was here at the weekend and we spent a bit of time assessing how her movement has changed. One of Sarah's concerns was that Ruby had started to dish before she went lame. Some horses just do dish, of course, but Ruby had previously moved straight and Sarah suspected the dishing in this case was related to her problematic foot balance. 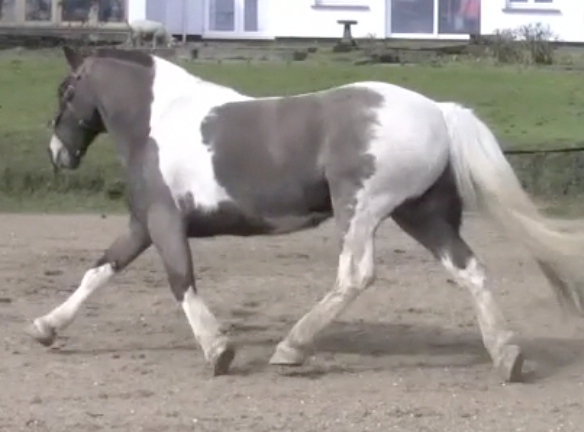 As with all horses, we filmed Ruby when she arrived and the dish was quite obvious, along with a landing which was off balance in front - she landed on the lateral side rather than completely evenly and flat rather than heel first. Six weeks down the line and we are beginning to see a straighter limb flight and the start of a better landing. 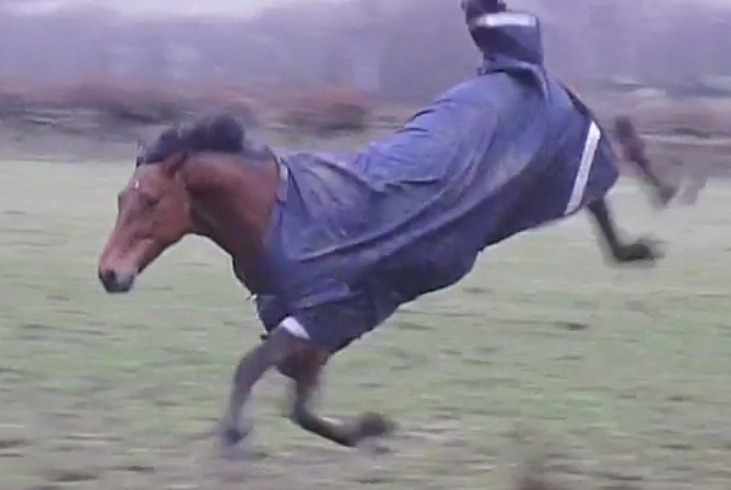 These are stills taken from the footage below, for those who are interested in seeing the whole thing. Of course, it took quite a while for Ruby's problems to develop and it will take quite a while to resolve them but its nice to know we are heading in the right direction! I had a particularly nice email come in over the weekend, with news of Rolie who went home last year. 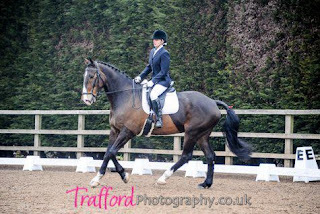 He and Katy went out competing for the first time in ages and as you can see from the photos, he looked a million dollars! Katy said: "It was a large class with over 25 in it & some nice horses, well he only went and won the class!! 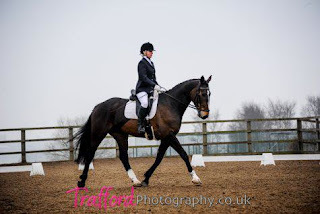 The judge's comments included 'smooth through turns', 'pleasing rhythm & outline' and 'well balanced' as well as the final comment of 'Beautifully presented, lovely polite harmonious test, super. Well done'. I was totally thrilled and so proud of him, I honestly never thought I'd get to compete him again, let alone win a class!" There's also this cracking photo of Lucy, who was here in 2011, out jumping and looking absolutely stunning. Well done to her and Amanda! Rolo - or "Mr Mohican" as SB calls him - has been here for 6 weeks and has proved to be a total dude. I'm putting his hoof pics and landing footage up below, but first take a look at these stills from his circle footage comparing day 1 with now. Rolo wasn't terribly lame when he arrived - he was slightly unlevel on the left rein but if you didn't know him (as of course I didn't at the time) you might not have thought there was too much wrong. 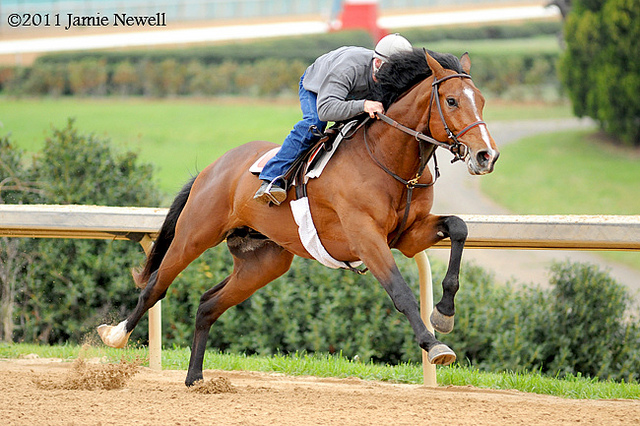 If this is him after 6 weeks, Lord alone knows how he is going to move once he has grown in a whole new hoof capsule! He had pretty nice cob feet when he arrived but although he was landing heel first on his RF he was landing flat on his LF and loading both fronts laterally rather than evenly. The hair is hiding a fairly steep new angle of growth - but I suspect it will only become visible if his hoof grows down faster than his feather! He had been out of shoes for 6 months before he came and he already had a pretty good frog and digital cushion but look at how much stronger it has become - and compare the length of the hoof wall - so much shorter today! His toe of course is much shorter now and despite his hairiness you can (I hope) see that there is on both feet less of a deviation in the hairline at the coronet - a sign of better balance. 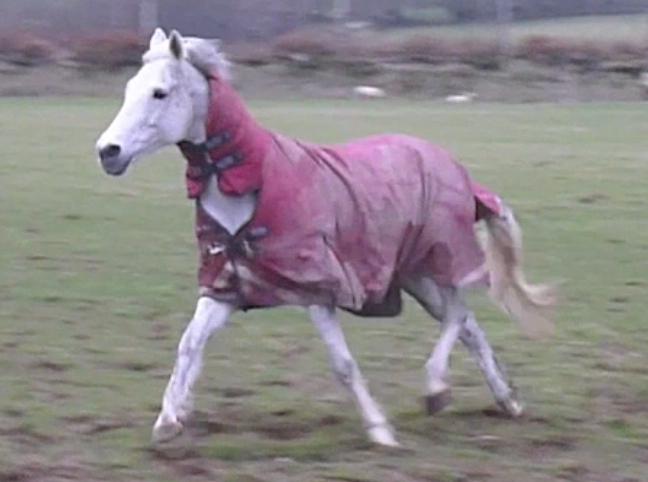 Here is his landing footage - a big improvement both in heel first landing and even loading over such a short time. As I said, Rolo's a dude! It was a big day for Bryher yesterday as I took Tegan, his mum, down to stud in Cornwall. He is 9 months old now and has Bailey, Felix and Charlie as his best mates - his mum had got rather bored of his antics truth be told. Once we had left, Andy turned Bryher, Bailey, Felix and Charlie out in his yard and field and they strolled off totally peacefully. No stress, no panic, just perfect...Phew! I took these pics last night - its tricky to get decent shots of Bryher because he is just way too friendly and inquisitive - they all tend to come out like the top one...! More updates - spring must be in the air!